I'm starting to get into best-selling non-fiction, the stuff propped up front right when you walk into a Barnes & Noble. It was never really my thing (I tried one Malcolm Gladwell book and was disappointed- also, Gretchen Rubin's ever-so-popular The Happiness Project was a bust), but I'm not too adventurous with non-fiction, so best-sellers are an easy go-to. Lean In caught my eye simply from the title. I was browsing through my library's front page, saw this title, thought "hmm, this could be interesting," and checked it out. And here begins my story. **Disclaimer: I haven't listened/watched any of Sheryl Sandberg's speeches prior to reading this book. I wanted to insert the ending to Sandy Sandberg's introduction to her book. It's a bit lengthy, but I think it's important to understand what this book is about, and who it is for. I highlighted parts I will reference later. "This book is not a memoir, although I have included stories about my life. It is not a self-help book, although I truly hope it helps. It is not a book on career management, although I offer advice in that area. It is not a feminist manifesto-okay, it is sort of a feminist manifesto but one that I hope inspires men as much as it inspires women. Whatever this book is, I'm writing it for any woman who wants to increase her chances of making it to the top of her field or pursue any goal vigorously. This includes women at all stages of their lives and careers- from those who are just starting out to those who are taking a break and may want to jump back in. I am also writing this for any man who wants to understand what a woman- a colleague, wife, mother or daughter- is up against so that he can do his part to build an equal world. 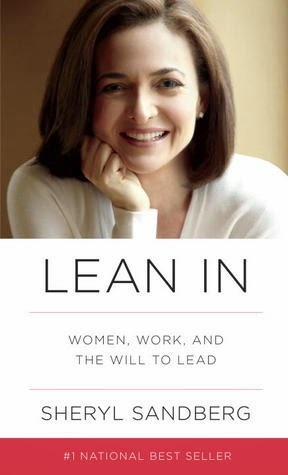 This book makes the case for leaning in, for being ambitious in any pursuit. And while I believe that increasing the number of women in positions of power is a necessary element of true equality, I do not believe there is one definition of success or happiness. Not all women want careers. Not all women want children. Not all women want both. I would never advocate that we should all have the same objectives. Many people are not interested in acquiring power, not because they lack ambition, but because they are living their lives as they desire. Some of the most important contributions to our world are made by caring for one person at a time. We each have to chart our own unique course and define which goals fit our lives, values, and dreams. I am also acutely aware that the vast majority of women are struggling to make ends meet and take care of their families. Parts of this book will be most relevant to women fortunate enough to have choices about how much and when and where to work; other parts apply to situations that women face in every workplace, within every community, and in every home. If we can succeed in adding more female voices at the highest levels, we will expand opportunities and extend fairer treatment to all." I like Sheryl Sandberg. All my knowledge of this woman came from within these 217 pages, but I like what I see. I felt the book was a good combination of personal stories, advice, statistics- all without a overarching sense of self-righteousness that turns many off to the idea of feminism. Though I do feel this book could be much more quickly summarized with a bullet-point list, I enjoyed all the personal anecdotes. Some of them were shocking, and that shock factor is often more affective than a skimpy list. One of my favorite parts is the section in which she discusses how individual women are self-sabotaging. She, of course, includes incidents of when she fell prey to this. Not too much actually. However, by the time I was 75% through the book, I felt like the horse that is being beaten with a stick. Don't get me wrong - I greatly enjoyed those first 3 quarters. But the ending felt a little repetitive- men gravitate towards men, women need to help women, women can sometimes be the problem themselves, and so on. What about men? Shouldn't this book be more about what men should do to help woman in the workplace and not just about all the wrongdoings of woman themselves? Men seem to be the bigger issue here. This book glosses over those who are non-elitist, such as the author herself. e.g. : being able to afford a nanny, or having her husband fly across the state on a weekly basis, etc. This book is largely targeting women. Sandberg states in her introduction (light blue highlight) that she hopes her book inspires men, but the contents of it are meant for women. And as a woman, I don't want to read a book about what others (men) should do to change my (woman) life. I should be taking charge, even if it means going the extra mile, to change my life. If men read this book, then that's great. But it's useless to read a book about what other people should do to change your life. (light green highlight)She acknowledges those times in her life when she knew she was more fortunate then most. Many of Sandberg's stories are her own, or those of her colleagues and peers. And as a privileged individual, her colleagues and peers are bound to those of similar privileged background as well. However, she is very careful to always put a disclaimer on her situations as such. She does not blindly take her wealth for granted. There is no book that will be perfectly tailored to every woman of every cultural and social background. But some people demand that one book must be a one-size-fits-all from cover to cover.